English: Great Lakes bathymetry and surrounding area shaded relief map. Lakes are contoured with interval 100 m.
The map was created using the Generic Mapping Tools, GMT, version 5.1.1. National Geophysical Data Center, 1999. Bathymetry of Lake Erie and Lake Saint Clair. National Geophysical Data Center, NOAA. doi:10.7289/V5KS6PHK [access date: 2015-03-23]. National Geophysical Data Center, 1999. Bathymetry of Lake Huron. National Geophysical Data Center, NOAA. doi:10.7289/V5G15XS5 [access date: 2015-03-23]. National Geophysical Data Center, 1996. Bathymetry of Lake Michigan. National Geophysical Data Center, NOAA. doi:10.7289/V5B85627 [access date: 2015-03-23]. National Geophysical Data Center, 1999. Bathymetry of Lake Ontario. National Geophysical Data Center, NOAA. doi:10.7289/V56H4FBH [access date: 2015-03-23]. National Geophysical Data Center, 1999. Bathymetry of Lake Superior. National Geophysical Data Center, NOAA. [access date: 2015-03-23]. National Geophysical Data Center, 1999. Global Land One-kilometer Base Elevation (GLOBE) v.1. Hastings, D. and P.K. Dunbar. National Geophysical Data Center, NOAA. doi:10.7289/V52R3PMS [access date: 2015-03-16]. 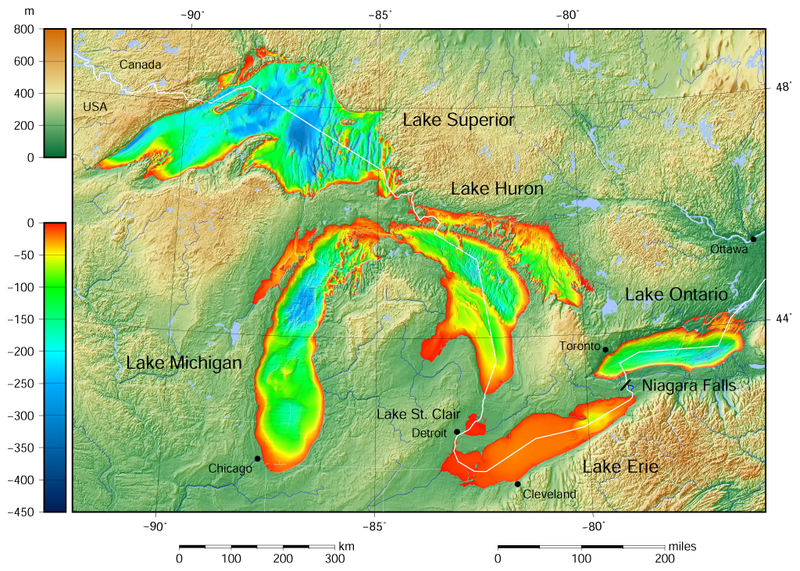 The color palette of the depth scale was made to be more or less similar to the color palettes used on the NGDC Great Lakes maps. (for credits see the Source section).